Sharp analysis from Thomas Pierret, published first at the Global Observatory. Some Western observers of Russia’s recent intervention in Syria are convinced President Vladimir Putin is making a mistake—and, following wisdom often attributed to Napoleon Bonaparte, one should never interrupt an enemy while they are making a mistake. By committing its own forces to the defense of beleaguered dictator Bashar al-Assad, some believe that Moscow is about to bog itself down in Syria the same way Washington got stuck in Iraq. However, proponents of this view should be wary the joke might well be on them. First, although difficult times certainly lie ahead for Russia in Syria, Putin’s intervention will make the conflict more destructive, destabilizing, and intractable, hence more detrimental to all parties. Second, the way Moscow defines success in Syria is hardly comparable to the stabilization-oriented approach adopted by the United States-led coalition in Iraq. Instead, by trying to destroy mainstream insurgents, Putin aims to reshape the Syrian war in a way that would leave Western countries with no other option than to supplement Russia as the protector of Assad. Russian intervention in Syria will make the war deadlier and heighten the refugee crisis spreading across the region into Europe and beyond. Although they have carried out some precision airstrikes against rebel headquarters, Russian forces have made a greater use of unguided ammunitions, including cluster bombs designed to wreak havoc over vast swaths of territory. As scores of these fail to explode, they will continue to kill civilians who will accidentally set them off years after the end of Russian operations. 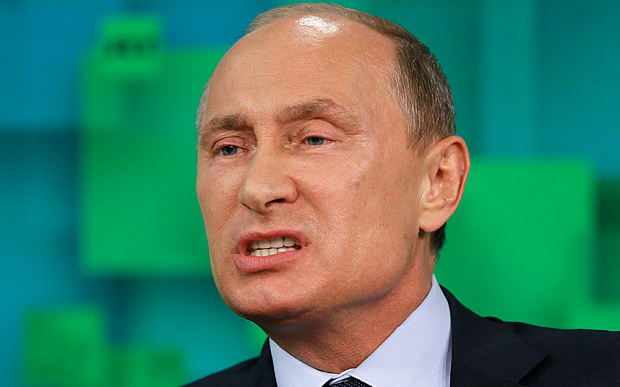 Russian attacks are not more discriminate than Assad’s, but they are far more powerful. Consequently, they have provoked new displacements of populations in regions whose inhabitants were already used to intensive shelling and bombing, such as the northern countryside of Hama province. 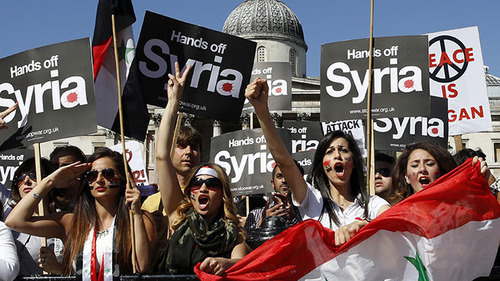 As people and groups from many countries, united by a common commitment to peace, justice and human rights, we condemn the military offensive that began with air strikes launched by Russia in Syria on 30 September 2015 and accelerating subsequently. While the Russian government has said that these operations were directed against the Islamic State (ISIS), most were on areas with no ISIS presence. The focus of the Russian military offensive appears to have been on opposition communities in the northern Homs region, a continuing center of resistance to the Assad Regime. The new imperialism is caring a bit too much about the suffering of people who are being brutalized by a regime which is not currently an ally of the United States – and the new anti-imperialism is not giving a damn at all, solidarity that extends beyond the border permissible only if the drawing of attention to their plight could not possibly be used as ammunition by the “humanitarian” militarists of the American empire. The world, in this view, is divided into but two camps: those with America and those against it, with the good anti-imperialist’s outrage dialed up if the atrocity can be linked to the United States, as well it should be, but dialed down to total silence if it’s not. This is, of course, the “anti-imperialism” of the reactionary, in more than one sense: How a person of the left responds to a pile of dead women and children is in effect dictated by how the U.S. government itself responds, the advocate of the poor and forgotten consigning foreigners to their fate – “not our problem, pal,” as one popular liberal congressman essentially put it on cable TV – if their interests have the misfortune of being perceived as aligned with America’s, the left’s commitment to internationalism abandoned for an inverted form of muddled nationalism that sees U.S. imperialism as not just one factor to consider in a complex world, but the only factor relevant in how we in the imperial core should view what happens on the rest of the globe. And if your cause is sullied by the perception it’s America’s cause too? The leftist sounds just like that liberal who sounds like Pat Buchanan: Sorry, pal, if you wanted our solidarity you should have been born somewhere that better lends itself to a black-and-white anti-imperial critique. Foreign Policy just published an article by David Kenner about a report on the Syrian conflict written for the US government by Nir Rosen, an ex-journalist currently working as a special adviser for conflict-resolution NGO Humanitarian Dialogue. For several months, Rosen has been promoting an approach to the resolution of the Syrian conflict that shifts away from political transition in favour of local truces, a stance that is not dissimilar to UN Special Envoy Staffan de Mistura’s suggestion to “freeze” the conflict. For many reasons, I do not think that this approach is in any way promising, but my concern here is different: it is rather the distinctly pro-Asad flavour of Rosen’s assessment of the conflict, which makes his piece look like an attempt at whitewashing the regime’s crimes, or to put it like Kenneth Roth from Human Rights Watch did it on Twitter, at sugarcoating deliberate mass-murder. Rosen likes to remind his interlocutors that he has spent most of the last three years in Syria, speaking to people from all sides. This might be part of the problem: he seems to have spent so much time with regime officials that he is now speaking exactly like them. 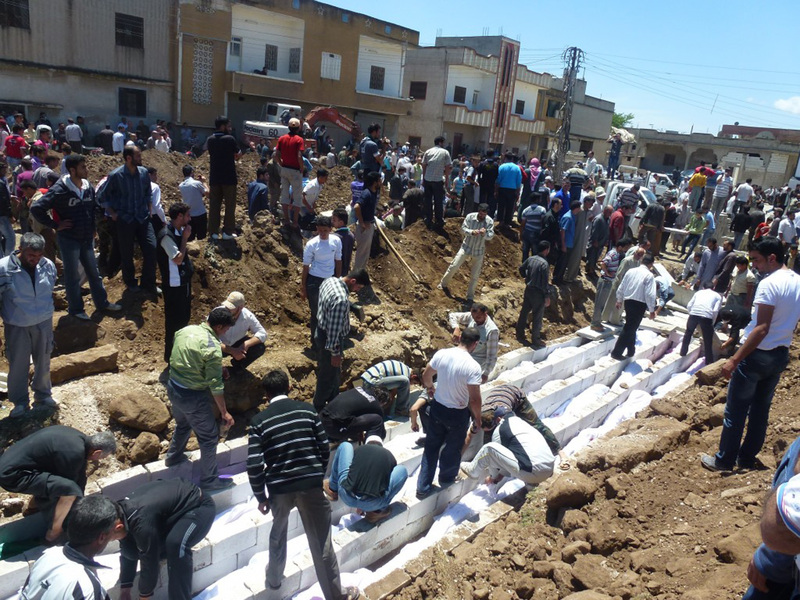 Rosen’s report includes an old Stalinist trope about the Asads’ achievements in terms of health, education and infrastructure, an argument even the most obtuse defenders of the regime have started handling with care after the regime started to deliberately destroy much of its own infrastructures to make life impossible in rebel-held areas. In the same vein, Rosen claims that the Syrian regime was not the worst in the region before 2011. This is seriously debatable: by 2010, an aggregate index combining state repression and human development would certainly have placed Syria at the bottom of the regional ranking. Then comes the breaking news: the Syrian regime is not sectarian, it is even staunchly secular! According to Rosen, the regime’s brutality towards the Sunni opposition “was done more out of a fear of Sunni sectarianism than as a result of the regime’s own sectarianism (sic)”. If Rosen is trying to tell us that the ruling clique in Damascus is not composed of sectarian ideologues, thanks, we knew that: Mafiosi are interested in power and money, not ideology. But that does not mean that their strategy cannot be deeply sectarian at the same time. The Syrian regime manipulated sectarian divides from day one. Does Rosen remember the first days of April 2011, when the Minister of Interior was branding the peaceful sit-in in Homs as a “Salafi Emirate”? Wasn’t that a not-so-subtle way to raise sectarian fears among minorities? Or was the Minister speaking so “out of fear of Sunni sectarianism”? Does Rosen remember that a couple of days later, Alawite auxiliaries were sent to kill protesters on Homs’ Clock Square? Did that also happen “out of fear of Sunni sectarianism”? Later that month, other Alawite militiamen were sent into the coastal village of al-Bayda, and filmed themselves tramping over the bodies of Sunni prisoners. An admirably non-sectarian move, once again! I had thought that faced with the same situation, a genuinely secular government would have sent uniformed security forces from other provinces rather than civilian auxiliaries from the rival local sect, but thanks to his three-year fieldwork expertise, Rosen redefined the whole concept of non-sectarianism: it means acting in a deeply sectarian manner while remaining staunchly secular in one’s heart. In December of 2010, Palestinian youth of the world watched anxiously, and participated in, the monumental dawn of the Arab revolutions. Many Palestinian young people, despite our inclination to be suspect of any emerging forces and rapid power shifts occurring, instinctively supported the political earthquake as the means of rupturing decade’s long neo-colonial structures. We joined our brothers and sisters in Tunisia, in Egypt and across the Arab world, in some cases symbolically and other cases literally, in the fight against their repressive regimes. Palestinians are a transnational people, deeply immersed in the disadvantages of being placeless and refugees. We are subject to the repression of those regimes not only by living under them but by their corroboration with the Zionist entity consequentially resulting in our people’s long exile and occupation. Support for the revolutions means standing with our brothers and sisters across the Arab world who suffer from the same systems from which we suffer, dictatorships structurally aligned with Zionism working to stifle movements of dissent as a liberatory catalyst in our region. December 2010 began a new era in which the face of existing power structures was obliterated. Yet, to some degree, a remaking of our part of the world became a grab for power to whoever has the most force and swiftness. In some cases, quick institutionalization through processes of Western-adopted “democracy” bolstered opposition entities into a position of “power” with limited opportunities to change realities on the ground. Rather, opposition entities were obliged to inherit the former regimes. Neo-liberalism rendered the new governments disadvantaged in their ability to yield real change on the ground for lack of economic autonomy, stability and resources. A turn to Western imperialist allies thus played a critical role in appropriating the aspirations of the masses which had deposed the former dictatorships. Still, the emerging new leaderships cannot be absolved of the partnerships they are choosing which contradict the aspirations of the people and concede on the political principles which had ultimately bolstered their position of power in the first place. News recently broke that the Stop the War Coalition (StWC) invited Mother Superior Agnès Mariam de la Croix to speak at its November 30 International Anti-War Conference. Fellow guests included MPs Diane Abbott and Jeremy Corbyn and journalists Owen Jones and Jeremy Scahill. Responding to a firestorm of protest, Jones and Scahill vowed to boycott the event if the Syrian-based nun spoke alongside them. Eventually she decided to “withdraw” from the conference and StWC issued a statement without explanation. Nor did it divulge why anyone would object to a Syrian cleric’s participation in an ostensibly pro-peace event. Here are some reasons why we consider Mother Agnès-Mariam’s inclusion in an anti-war event to be a “red line” for opponents of conflict. Despite contrary claims, she is a partisan to—rather than a neutral observer of—the war in Syria. 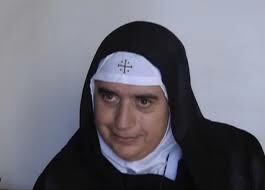 According to Father Paolo Dall’Oglio, a Jesuit priest exiled by the Assad regime for speaking out against its suppression of peaceful protests and currently a prisoner of al-Qa’ida’s Syrian affiliate, ISIS, Mother Agnes “has been consistent in assuming and spreading the lies of the regime, and promoting it through the power of her religious persona. She knows how to cover up the brutality of the regime”. Having a massacre denier and apologist for war criminals like Mother Agnès speak alongside respected journalists such as Jeremy Scahill and Owen Jones is not only an insult to them and their principles. It is also, more insidiously, a means of exploiting their credibility and moral authority to bolster hers, both of which are non-existent. No journalist should be sharing a platform with Agnès when she stands accused of being complicit in the death of French journalist Gilles Jacquier by his widow and a colleague who accompanied him into Homs during the trip arranged by Mother Agnès in January 2012. Given that her UK speaking tour is still scheduled to last from the 21st to 30th November we, the undersigned, feel compelled to express our profound and principled objections to those who give a platform to a woman condemned by Syrian pro-peace Christians for greasing the skids of the regime’s war machine. Syrian-American architect Lina Sergie Attar is the founder of the Karam Foundation and its Zeitouna project which brings hope to Syrian displaced and refugee children, many of whom are traumatised, all of whom have lost great chunks of their schooling. 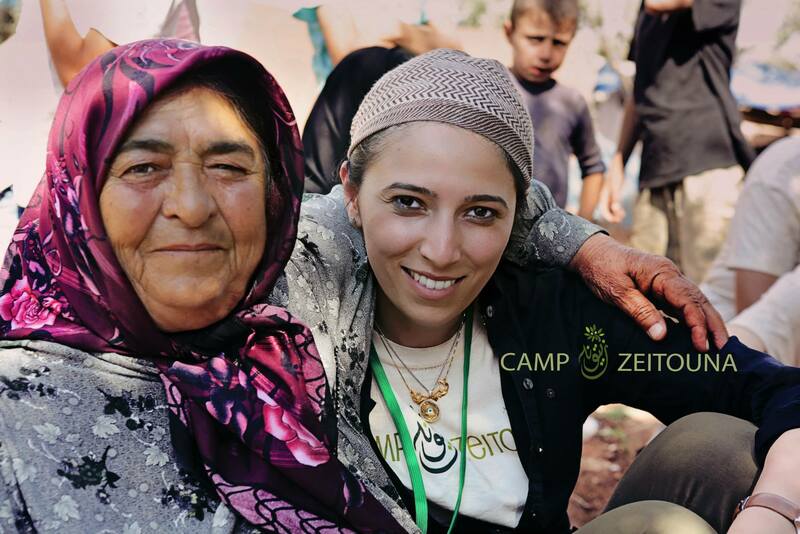 Pulse co-editor Robin Yassin-Kassab participated in June’s Camp Zeitouna in the Atmeh camp on the Syrian side of the Turkish border. In this moving piece, originally published at the New York Times, Lina describes the workshop she led with the children in their hot and dusty tented school – mapping a floor plan of their abandoned homes – and what it meant to them. Please donate to the project and Karam’s other work inside Syria here. After enduring two and a half years of the grueling brutality that defines Syria, the fall of Assad’s regime is no longer the most pressing concern of most Syrians. Rather, “When will we return home?” is the question that haunts the over seven million displaced Syrians. Of course, the fact that the first concern is the reason the second one exists adds to the country’s mass despair. Last winter in Atmeh, the largest of Syria’s border camps for the internally displaced, the longing to return home was repeated to me over and over — sometimes in anger, other times in sorrow. I could not answer their inquiry, “Will we ever return home?” except with the traditional, “God willing.” A response that should have been comforting if my wavering voice hadn’t betrayed my uncertainty. When I returned to Atmeh last June, the camp had doubled in size from 12,000 to over 24,000 people who had fled their villages and towns to seek refuge in rows of tents between the olive trees — literally in no man’s land. They were as I had left them, still surviving without running water, electricity, and adequate sanitary services. The biting cold of December had been exchanged with the suffocating summer heat. The snow-white tents were now permanently coated with brown dirt streaks. The camp which had been still in formation a few months before, now felt unsettlingly settled. I did not return alone. I returned with a team of Syrian expatriates to hold an educational mentorship program for displaced children called Zeitouna. The idea behind Zeitouna was to inspire and engross Syrian children with creative and athletic workshops that would engage their young minds. We returned to show them that they mattered. And that they had not been forgotten.